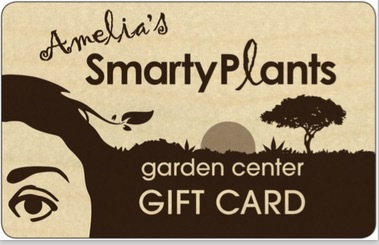 At SmartyPlants, we have been busy restocking pottery, hard goods, and plant material. Of special note is our expanded line of pots from Crescent Gardens. With their Tru-Drop feature, this line incorporates a self-watering system within a double-walled, molded, decorative planter that is 100% recyclable, won't crack or fade whether used inside our out, and is warranted for 10 years. They are sturdy yet light weight, have a drainage plug, and offer a visual three-logo water gauge to indicate the water level inside the reservoir. Crescent Garden planters offer contemporary, chic shapes, and bold colors to decorate home or garden. We have also expanded our plastic pot line from Matri LLC to include more colors, sizes, and designs. This Argentinian-based company has been a leader of garden accessories in South and Central America for 20 years, and entered the U.S. market in 2013. Their durable plastics include round and square pots and saucers, rectangle window boxes and saucers, and half-circle wall pocket planters. The Matri products are an excellent choice for an economical way to enhance your garden or patio. New adorable fairy garden pieces found their way to our collection including a new gourd house, pretty new fairies, some cute playing squirrels, bunnies, a gentle dragon, some ready-to-pounce kittens, and a few other very sweet flowery accessories. The glow-in-the dark tulip lanterns will light up your fairy gardens. Aquatic plants has been an instant success! We are working on our third shipment of these beauties. After the new year, we will be providing in-depth information on the care and raising of aquatics for those of you who want to add a water garden to your outdoor space. Our shade house is full and looking gorgeous with numerous cacti, succulents, agaves and bonsais in the 30%-shade side. The 60%-shade side is filled with dieffenbachias, aglaonemas, indoor palms, and numerous dracaenas. We have a new bromeliad display which houses one of the largest selections of bromeliads that we have ever had. Annual tables in the full-sun area are filled with seasonal color. Impatiens, geraniums, petunias, begonias, kalanchoes, alyssum, and many more are waiting to be added to your garden beds, pots, or hanging baskets. This fine terracotta line has been restocked and revamped with old and new designs. What makes this line beautiful and unique is that they are fired in low-temperature kilns, which makes them somewhat porous. As water seeps through the walls, an aging process occurs that gives these planters their characteristic old-world look. Campo De Fiori will be 15% off until the end of the year.